Why Did this Image Cause a Traffic Spike on TomRoelandts.com? At first sight, this image has nothing to do with my site. I have not posted it or mentioned it. The picture is real, by the way, it is not “Photoshopped”. 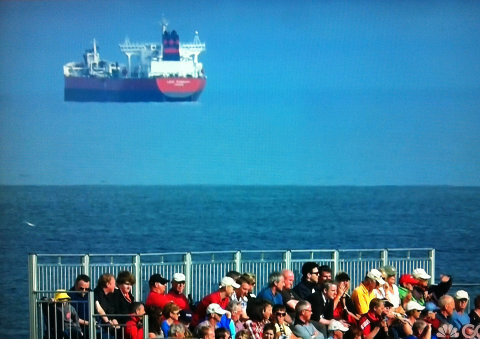 It is from TV coverage of the Scottish Open golf tournament in Aberdeen, and the effect is caused by atmospheric refraction. But the details of the photo are not important for this story. The point is that my site has nothing to do with this image. I actually hadn’t seen it at all when I went looking for the source of the spike. The traffic spike was to The Looming Effect, but when I tried to find the source, I found that most of the traffic was from organic search (people searching on Google and other search engines). This is quite unusual, and I searched for looming effect on Google to see what would come up, noticing this striking image of a seemingly floating ship. And this turned out to be the reason for the spike. This image caused a lot of people to search for looming effect, since the atmospheric effect that makes the ship seem to float is called looming. This only happened because the image has gone viral and has been featured on several popular sites such as BuzzFeed (with a good explanation of the effect), reddit, and 9GAG, generating a lot of interest. And I happen to have an article called The Looming Effect that has been scoring quite well on Google and other search engines (on Google, it is typically one of the first few results, [try the query]). This is probably because it has been picked up on a number of motorcycle sites, since my article is one of the only sources that has an actual animation of an approaching vehicle that demonstrates the effect. The photo shows a completely different kind of looming, but you don’t know that before you click the link, of course… Hence, a traffic spike. I though this was mildly funny and wanted to share it with you.